Team Evotri: Pro-to-Pro, Part Two! Part II of Pro to Pro with bike hammer head, Andrew Starykowicz interviewing upcoming pro Jeff Paul. Andrew: Coming from a running background and now crossing into triathlon, define suffering...is suffering in Triathlon and Running the same? Jeff: Suffering…for me suffering has always been when physical or mental performance begins to decline due to the high stress levels a race can place on the body and mind. Suffering for me has definitely been different in running than triathlon. Physical suffering, completely different…in running I know I’m suffering when my legs begin to tire and I completely fall off the pace. Most of the time after races when I look back the suffering was more mental than physical…i.e. I didn’t think I could handle the pace and thus my body slowed down. It’s a much different feeling in triathlon. I think of suffering in triathlon when my body is actually starting to restrict performance most often through cramping. It is why nutrition plays such a role especially in long course events. In regards to the mental aspect of suffering for me it is totally different between (only running), and triathlon running. If I’m doing a running only race, I find myself wanting it to end as soon as possible. That mindset probably creates more physical problems because I think about how much it hurts. In triathlon I am quite the opposite. Because the run is where I can gain time on competitors I don’t want it to end. The longer we have to go the better. Mentally it is a huge plus because I wouldn’t want the race to end unless I’d gotten a chance to get to the front. - want to go out for a beer close to a race? - want to go to an event and you have a big workout to get in? - ask you how you are doing (and you are wasted from the days workouts)? Jeff: The social life…oh boy. There's no doubt my time is restricted when I'm into full training mode. If it's during the school year I'm spending 40 hours a week working on top of 20-30 hours a week in total training time while trying to be a good husband and father of two young children. If a friend wants to go for a beer close to a race, I'll do what I almost always do when something comes up...I'll ask my wife for permission. Sometimes I know not to even ask if I've been gone training a lot. My first thought would be on how much time I've been gone as opposed to the race since I don't think a beer would hurt. Now if they were going out late into the night partying I'd decline and tell them why because I want them to know what I'm committed to. Most of the time they don't ask any more because they know my plate's full. Honestly, I don't think there are many events as important to me as some of the big races. I've invested so much time and sacrificed so much that it would not be worth missing a key workout unless the schedule allowed for the workout to be moved easily to a different day. When they ask how I'm doing after a tough day of workouts I normally tell them what I did and I don't have to say much more than that. I think there are many people who don't understand why triathletes, even most age groupers put in the time they do training. 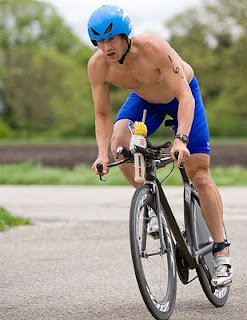 Triathlon is an addictive sport and training for some becomes part of their lifestyle. They have to get it in. This can be fine if they keep other things in balance but I find it's toughest for me when I feel an injury or sickness coming on and I struggle to back things down. In summary, I have told friends when I'm in full training that I really have no social life. Something's got to give in the circle of time and right now I'll sacrifice social life to pursue my dreams. Jeff: I’ve always loved to compete. I played about every sport out there growing up…even soccer which I terribly regret. One thing was always constant regardless of the sport I was competing in…I loved to compete and hated losing. It didn’t matter if I was racing my brother through a word search during church service, trying to throw the football through the tire swing in the back yard, playing one on one basketball games in the snow covered driveway…I loved to compete. Even still today in my classroom I play my students in Connect 4…a game I’ve mastered. I tracked my success against them through the year and had 196 wins versus 5 losses last year. Each of those losses had me fuming on the inside although I tried to hide it from the class. Two years ago, I started the summer at nearly 200 lbs. I’d been a recreational triathlete the past few summers. I almost decided to not race that summer because I was so fat and out of shape. Through the summer I lost about 25 lbs. and began having success in races. I started wondering how good I could be if I devoted everything. I knew that would mean I’d have to stop coaching track and cross country during the school year. I’d just been named the head track coach for the upcoming season but the more I thought about going “all in” for something, the more I was drawn to the idea. I knew I had potential and the idea of finding out how good I could be was too good to pass up. My wife and I sat down and talked about it and she threw her support in my corner. That was important because with two children (one at the time), I could not train as much as I do without her being in this journey with me. I have my whole life to get back into coaching…I want to spend a few years competing against the best in the world simply because I can. When I’m done, I want to know there was nothing more. I’m on this journey to find my potential. It’s been well worth it. The journey has helped me to lose 49 lbs. from my peak of 202, and I have more energy for everything I do. Andrew: Pertaining to your big race career that is just starting; would you rather have a career in triathlon of mainly mid pack (5th-10th place finishes) with one or two big wins or consistent podiums, but lacking the crown of race champion? Jeff: If I had to choose between a career of consistent podium finishes or a bunch of mid-pack finishes with one or two big wins I’d definitely go with the mid-pack finishes with one-two big wins. This may be different if I stopped teaching and needed to be on the podium to support myself and my family financially. With money not an issue, winning a big race would be something I would remember forever. It’s hard to imagine how many hours, how much pain, how many sacrifices go this entire journey…to win a big race would forever be a reflection of how much it took to get there. Part of what motivates me is finding out how good I can be in the sport. When I stopped coaching to begin this journey my goal was get my pro license within 2 years. It was something I thought about every day in training. When I got it in October during year one, I wondered how my motivation would change now that I’d reached what I set out to accomplish. Almost immediately, my focus went to proving to myself and others that I belong in the pro field. I’m inspired to find out how high up the ladder I can climb. If I could win one big race, I’d feel pretty good about how far I’ve come. In a different kind of way, I’m much like you in putting aside something (in your case the job and in my case coaching) to chase this dream. A big win would be extremely meaningful in how far I’ve come. I had a lot of people who thought I was nuts because they knew how much I loved coaching and we’d had a lot of success winning three state cross country titles and one in track and field. The doubt of others only fueled my fire and I know there are those out there who think I’ll struggle in pro races. That fuel makes it easy to train hard. Andrew: If you had the opportunity to have the talent of 1 athlete for one day, who would it be and why (PS: it does not have to be a triathlete)? Jeff: If I could have another athlete’s talent for a day it would be Michael Phelps. I would use that talent to feel what it is like to swim much faster than I’m capable of. My hope is that by feeling the water like he does I’ll be able to do it myself when his talent leaves me. I see such tiny improvements with my swimming month after month and I feel it must be technique related. I watch videos of myself, videos of other…Phelps included, practice drills and technique…and I feel the same speed week after week. I’d like to have his talent for one day, but then learn from that experience so I can be faster for the rest of my life. Thanks guys for phenomenal questions and responses. Great insights from both of you. I know both of you are dealing with setbacks in the form of injuries right now. Know that Evotri is behind you and wishes both of you a speedy recovery. For updates, check out Andrew’s Blog and Jeff’s as well. Both are excellent reads.